Studio Cultivate’s primary objective is to help young people engage with the natural world through story-telling, practical activities and outdoor exploration. I’m delighted to use my first Studio Cultivate blog as an opportunity to welcome you to Studio Cultivate’s shiny new website, designed as a platform to bring together our three outdoor educational projects; Kindergarden, Merristems and PlayGreen. For the first time since Studio Cultivate’s ‘germination’ in 2015, parents, pupils and educational operators will be able to keep up to date with all our exciting projects, ambitions and dreams. The website also provides those less familiar with Studio Cultivate with an intro to what we do and our unique way of doing it! And finally, I hope the website will become a vibrant hub for like-minded people with a passion for the natural world. I do hope you enjoy what you see and read. Spring has certainly arrived in London. 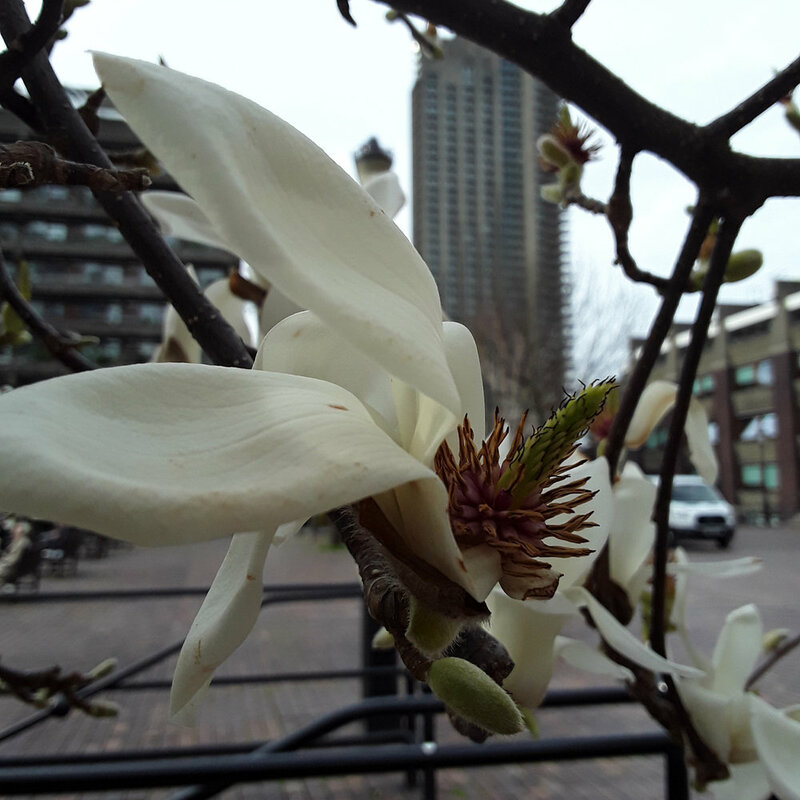 Temperatures are wildly fluctuating and the wind is tearing through the city, ripping delicate blossom from magnolias (see photo) and cherries and slowing my cycling to a near standstill. The lurid yellows of daffs are everywhere and even honey and bumble bees are sleepily emerging, in time to gobble up the last of the pollen from Mahonia blooms. Our Kindergarden schools’ autumn sown broad bean and sweet-pea seedlings have had an incredible acceleration in growth in the last few weeks, and if the clement weather continues, I predict we’ll be harvesting by mid-May. We have just helped our Merristems school in Camden overhaul its old playground with the installation of a number of large planters, 5 of which have been planted with fruit trees. The remaining will be allocated to edible and pollinator friendly planting. This school is located in a particularly grey part of London and I am hugely excited by the prospect of helping the school’s pupils create a vibrant, productive garden and learning backdrop. Our Kindergarden pupils are about to commence the SnackPot project; an intensive seed sowing scheme that brings together pupils, parents and schools through the creation of edible gardens. For Spring 19 I have sourced the Mammoth Russian variety of sunflower seed to be each garden’s centre piece, so keep an eye out for some truly whopping sunflowers popping up around central London! I am also busy writing my next article for Nursery Management today, so stay tuned for this. As for the Studio Cultivate team, I am thrilled to welcome back my old friend and collaborator George Nicholls from a highly successful trip to Bermuda and New York, where he was touring A Midsummer Night’s Dream. George will be busy delivering Kindergarden and PlayGreen workshops over the next few months. Happily, Vanessa continues to play a vital roll in the delivery of KIndergarden, whilst impressively studying for a Art Psychotherapy Masters. Excitingly for us, Vanessa is focussing her studies in Child Development and I really look forward to seeing how this can feed into what we do. I would also like to take this opportunity to welcome Jen Botezat to the Studio Cultivate team. Jen certainly shares our passion for the outdoors. When not delivering KIndergarden, Jen is busy running her own garden maintenance company, volunteering at Kew and blogging. Check out her great work here https://ladygreenwell.com. Jen will be helping me establish a new south East London branch of KIndergarden this Spring, so if you work for / send your kids to / know of any schools that might be interested in helping their kids understand and care for the natural world do let us know.